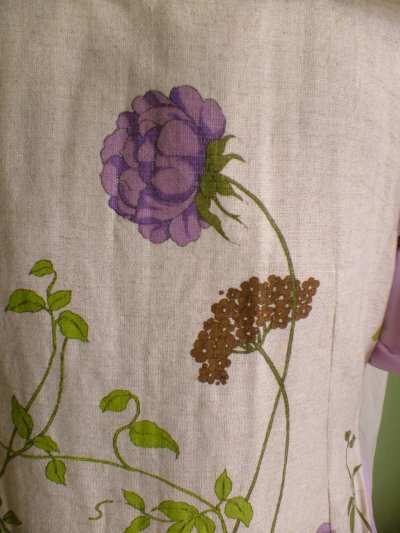 1960s hippy-chic vintage printed linen tabard dress. OK - I admit it - I've never seen anything like this particular dress before! 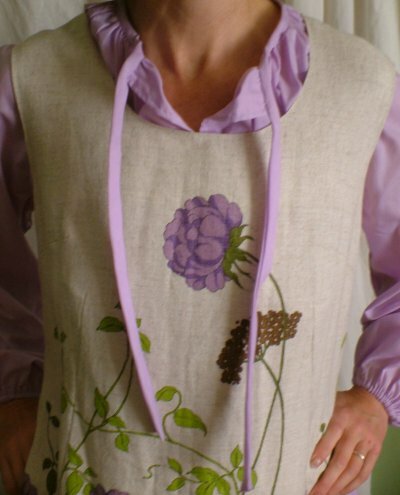 It's in two parts: a long, full-sleeved, tie-neck shift in plain purple (with embroidery at the hem); and a sleeveless, split-sided, coarse linen tabard printed with a variety of flowers including cow parsley, dahlias, and roses. The two parts could be separated - and the tabard would look good over cigarette pants, or even jeans - and are very well made and finished. I guess the dress has come from a small, exclusive shop: there are no labels at all, yet this shrieks 'designer'! The whole dress has a sort of arts-and-crafts, 1920s look about it. In perfect condition, approximate measurements are: bust 38½ ins /98 cms, waist 37 ins /94 cms, hips free (these taken from the tabard, the shift being larger).